We hope that every Guest can experience our entertainment and spend quality time together in our parks and resorts. We enable synchronized seamless experiences for Guests with sensory disabilities through the Disney ACCESS™ System, featuring Disney SyncLink™ technology. Our goal is to be the safest and most accessible place in the world. Describes key visual elements for Guests with visual disabilities. Synchronized in-between existing show audio. Portable text captioning system for Guests with hearing disabilities. Provides synchronized captions in theaters, on moving rides, and other locations where traditional fixed captions are not feasible. Amplified audio for Guests with mild to partial hearing loss. Automatically detects location and provides amplified, synchronized audio. Connecting handheld devices through multiple methods of communication to their environment. 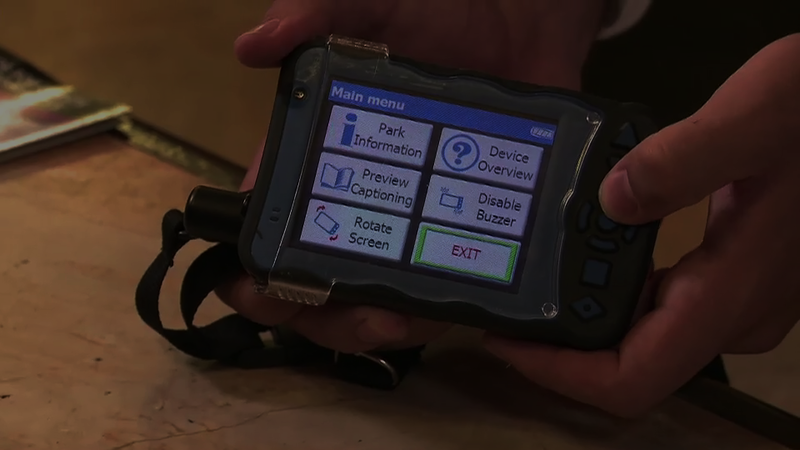 Whether the Guest is exploring outdoors or indoors, a handheld device featuring Disney SyncLink™ technology can seamlessly deliver synchronized content related to the environment. Multiple location detection technologies, indoors and outdoors, enable complete coverage of an entire park or venue. Defined areas automatically trigger content on the handheld device, or the Guest can access content manually. To view product information, see where this technology is being used outside of Disney, or purchase the Durateq handheld device featuring Disney SyncLink™ technology, please visit the www.durateq.com website. The transmitters communicate location information to the visitor device as it moves throughout an area. Whether it’s a walking tour, theatrical film, or a moving ride, the experience is always synchronized. Timing information from an attraction or show can be sent from the transmitter infrastructure so the device knows where it is as well as what is going on around it. The same infrastructure can power all the services offered on a handheld device indoors or outdoors, even in direct sunlight. Multiple transmitter designs allow for different areas of coverage. A single small transmitter can be easily hidden in a location and cover an entire room. Larger emitters can communicate with an entire theater at the same time. To view product information about transmitter technology, see where this technology is being used outside of Disney, or purchase transmitters to install an accessibility system in your area, please visit the www.gantom.com website.